Capitol Reef National Park is located in south-central Utah. Its main feature is the 100-mile long Waterpocket Fold – a giant wrinkle on the earth. The scenic park drive only offers a glimpse of the geological features found in the area. Further exploration by foot or 4-wheel drive is a must! -Stay: Located in the nearby town of Torrey, UT, the Rim Rock Inn offers convenient accommodations for a reasonable rate. The hotel has 2 good restaurants on site and is close to the park entrance. -Hike: The Capitol Gorge trail (2 mi. rt, easy) follows a wash that cuts through the Waterpocket Fold, with canyon views, petroglyphs and pioneer inscriptions. A moderate spur trail to a series of water pockets is also worth it. -Drive: The 59-mile Cathedral Valley Loop offers visitors access to the much less travelled northernmost section of the park. If you have the time and a suitable vehicle – it took us 6.5 hrs in our rented Jeep – the views are plentiful and absolutely stunning. -Drive: The Burr Trail Road offers a unique approach to the park, travelling through its southern section. We drove the entire 68-miles from Bullfrog, UT to Boulder, UT, including an infamous series of switchbacks climbing 800 feet in half a mile! Even though some sections are paved, check with a ranger beforehand to make sure the road through the park is passable to all vehicles. 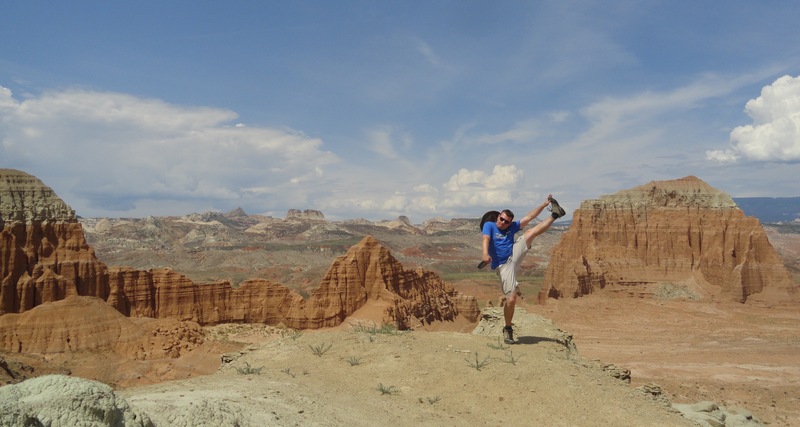 This entry was posted in High Kick Photos and tagged Burr Trail Road, Capitol Reef National Park, Cathedral Valley, High Kick, Rim Rock Inn. Bookmark the permalink.